Making sure that your children get all of the vitamins that they need throughout the day can be a rather difficult task. Although you can sometimes get them to eat certain fruits and vegetables from time to time, my kids often avoid most vegetables even after introducing the vegetable multiple times. I do worry that my kids, through their refusal to eat many vegetables, aren't getting the nutrition they need. 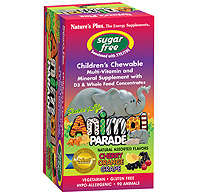 This is where Nature's Plus Animal Parade childrens vitamins come into play. When you cannot seem to convince your child to eat enough good food throughout the day, it is possible to supplement their diet with multivitamins or specific vitamins. With the sugar free vitamins from Nature's Plus, you will be able to get your kids to actually enjoy the process of taking vitamins. These vitamins are sugar-free and contain tooth-friendly Xylitol as a sweetener. The vitamins come in a variety of flavors including cherry, watermelon, orange, and grape. My kids love taking their chewy vitamins and I am relieved knowing that my little ones are getting a healthy amount of calcium, vitamin D, and omega-3 fatty acids in this one a day kids vitamin.